Luxury SUVs and competitively priced aren’t usually mentioned in the same sentence, and for good reason. Top-line models are indeed pricey, what with all the convenience amenities and technologically advanced gadgetry. 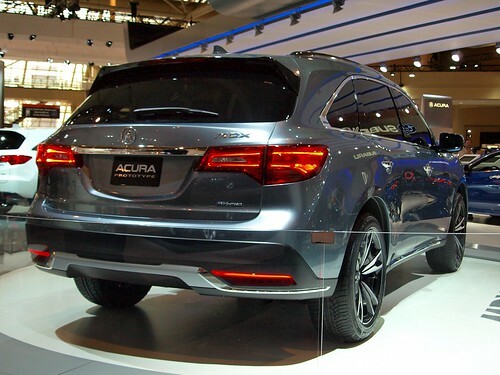 However, for the price paid, consumers will find it tough to beat the 2013 Acura MDX. This model is roomy enough for seven passengers without the cramping that can occur in some of its competitors. The interior is also very nicely equipped, and the cabin is loaded with passenger-friendly equipment. 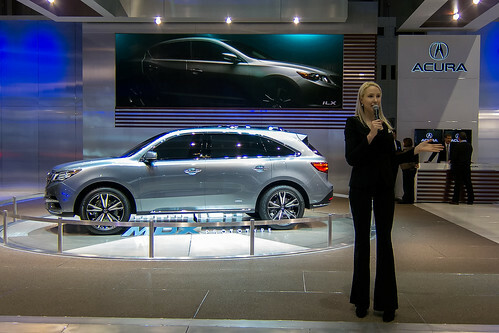 The 2013 Acura MDX remains basically unchanged from the 2012 model. This is a reflection of the positive feedback given by satisfied consumers. The model is still available in a single trim, with a couple of package options available. These include towing, all-season protection, and roof rack. Buyers have a choice of six exterior color shades, ranging from White Pearl to Graphite Luster Metallic. The model can be purchased with Ebony, Greystone, or Parchment leather interior fabric. The overall look of the vehicle is quite appealing to those who prefer a sleek, finely shaped crossover. The front end has a rather smallish grille, surrounded by wide headlights and low-set parking lights. The rear is shaped much like a full-size family sedan, with rounded side contours forming a nicely curved tail. The 2013 Acura MDX is rated at 16-mpg city and 21-mpg highway, which lags most of its peers. However, its 21-gallon fuel tank means plenty of highway miles between fill-ups. The model comes with a 6-year, 70K-mile powertrain warranty, and the Super-Handling All-Wheel Drive System. Under the hood of the 2013 MDX lies a 3.7L V-6 engine that delivers a total of 300 horsepower. The engine is connected to a 6-speed automatic transmission. Acceleration is very smooth and quite responsive after an initial hesitation in the lower gears. The vehicle hits 60 mph in just over seven seconds, about average for many of the seven seat luxury crossovers on the market. The front suspension is MacPherson strut, with multi-link suspension in the rear. The vehicle boasts 4-wheel independent suspension, and the ride is very smooth. With plenty of room for seven passengers, the comfortable interior is one of the highlights of this model. The Panasonic surround-sound system is top-notch, and the seats are quite soft, with easy-to-use reclining controls. The driver information technology is state-of-the-art, and the center instrument cluster, although a bit intimidating at first, is very thoughtfully laid out. The model has a total of 85 cubic feet of cargo area, which is competitive in the mid-size and full-size SUVs currently on the market. Another wonderful feature of the MDX is the inclusion of cleverly placed storage compartments. A total of four storage areas are within hands reach of the driver, including a clamshell opening in the center console. The 2013 MDX has a total of six airbags including two front units, two side units, and two side-curtain units. The vehicle contains 3-point seatbelts in all seven seating positions, and the driver/front passenger positions have active head restraints. The LATCH system of anchors and tethers is standard equipment. The vehicle is equipped with a tire pressure monitoring system, and the windows and moonroof have a auto-reverse feature that prevents them from closing if there is an obstruction such as a child’s hand or finger. The Acura MDX features the Vehicle Stability Assist™ that constantly monitors the speed and steering angle. The security system automatically disables the ignition and sounds the horn if a break-in is attempted. The Acura MDX is a solid competitor in the seven-seat luxury crossover category. It has a nice blend of luxury, style, performance, ride quality, and handling. The MDX’s competitors include the Infiniti Q35, Volvo XC90, Buick Enclave, and Audi Q7.